In the late 1890s, cirl buntings were quite widespread and locally common across the UK, occurring as far north as Cheshire and into parts of Wales, yet within 100 years they have become one of the UK’s rarest farmland birds. 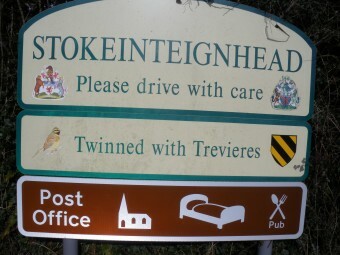 By the late 1980s, the population had suffered a large decline, just 118 pairs left in the UK, and a substantial range contraction, mainly confined to the coastal fringes of south Devon. For a species intrinsically linked to a ‘mixed’ (arable & pastoral) farming landscape, changes in the agricultural industry during the 20th century had a catastrophic effect. 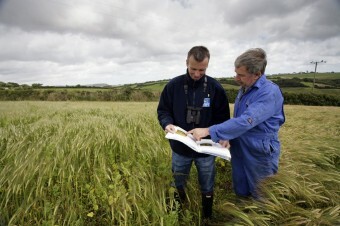 Increased production and technological advancements led to autumn- sown cereals replacing spring-sown varieties, larger field sizes, increased fertilizer and pesticide use and the specialisation of farms (ie all arable or all pasture), ultimately resulting in the loss of suitable habitat for the cirl bunting. 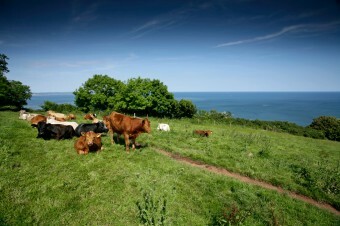 The birds most likely held on in south Devon because the area still supports many small family-run farms and low-intensity mixed farming systems. 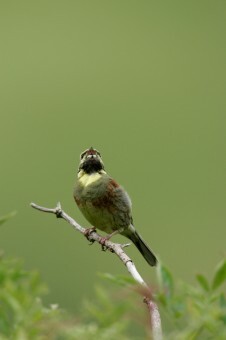 These small birds, the size of a sparrow, are a close relative of the yellowhammer, but are distinguished by the male’s striking black ‘zorro’ eye strip and yellow head, and attractive green, yellow and brown chest. Both sexes have olive-brown rumps whereas yellowhammers have chesnut rumps. Cirl buntings are very sedentary birds so need all their habitat requirements in a small area. 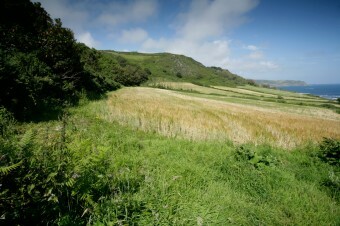 They fare best in traditional mixed farmland – a landscape characterised by a patchwork of small arable fields and grazed pastures, bounded by tall, thick hedges, and abundant scrub on valley slopes and in field corners. During the breeding season the birds will nest in dense hedges or scrub; using this vegetation for shelter and will normally feed close to field boundaries. The birds will often move no more than 250 metres from their breeding territory to feed, foraging in tussocky grassland in search of invertebrate prey, such as grasshoppers and crickets, to feed their chicks. Cirl buntings switch to a seed based diet during winter and can travel up to 2 kilometres from their breeding territories in search of food. The proximity of arable fields to their territory is therefore vital to ensure the birds can access sufficient food to survive the winter. Spring barley left as over-winter stubble provides an ideal open structure for the birds to search for small arable weed seeds or spilt grain on the ground. The RSPB cirl bunting project was set up in the 1990s to provide free advice to farmers and landowners and work with local communities to reverse the fortune of this species. Over the past 25 years we have developed trusting partnerships with many of our farmers who have risen to the challenge to provide habitats for the cirl bunting. 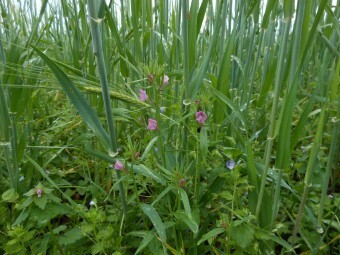 Many have entered government funded agri-environment schemes which offer tailored management options for this species, such as over-winter stubbles, grass margins, wild bird seed mixes, low input grassland and managing hedges sympathetically. As a result, the population currently stands at 862 pairs, although with limited range expansion. The majority of the population is still confined to the coastal fringes of south Devon, but there is now a re-introduced population of cirls in south Cornwall, and the famers there are enthusiastic to welcome back to their land a bird that recently became extinct in Cornwall. Other farmland wildlife has also benefitted as a result of the land management undertaken for cirl buntings. Providing grass margins to increase invertebrate prey for cirl buntings in the summer months also benefits invertebrates such as butterflies, bees, bats and small mammals. Sympathetically managed hedgerows are also important to a variety of species such as the grey long-eared bat and greater horseshoe bat which use hedgerows for foraging moths and beetles. Retaining spring sown barley within the landscape has ensured the survival of some rare arable plants that depend on spring germination. Although the needs for this species are simple – a safe nesting site, grasshoppers in summer to feed its chicks and weed seeds during winter – its future still remains under threat. Without farmers deciding to take on cirl bunting friendly management, much of the habitat that has become available to cirl buntings over the last 25 years would not be in existence. 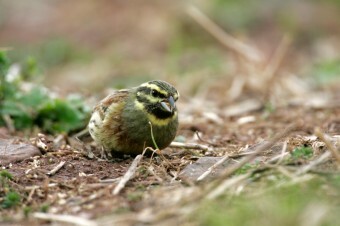 However the reliance of agri-environment schemes to deliver for farmland wildlife in the long-term is uncertain, and with increasing pressure from built development across parts of the cirl bunting range, suitable habitat is becoming squeezed and further fragmented leaving little opportunity for range expansion. To ensure the cirl population has a future, an integrated approach to sustainable land management must be supported, enabling farmers to choose management which maintains wildlife, yet supports a thriving rural economy and encourages communities to be proud of their environmental heritage.